Place a piece of sheet metal of about 150 x 120 mm at the hot air gun´s nozzle. It acts like a shield to protect the housing of the hot air gun from getting too hot. It is not attached to the oven. I remove it when I put the sections into or remove them from the oven. All in all I spent about $10 for the material to build the oven. To power up the whole thing requires a some more money. I use a hot air gun made by BOSCH, type PHG 600 CE, 2000 watts, 110-600 °C temperature range, infinitely variable. There still are some misguided souls out there who think that this device only good for stripping off old paint. I my humble opinion it is the best heat source for straightening nodes, bamboo strips and rod sections, so it is a excellent investment for every rodbuilder's workshop. To control the temperature I use an electronic thermometer with separate thin wire feeler, temperature range from -65 to 115 °C. This kind of thermometer is very accurate and reacts very quickly to temperature changes. The feeler can be inserted into the inner tube at the locations marked "1", "2", and "3" in the drawing on the previous page. Operation: The combination of the fully adjustable hot air gun, the thermometer and the operator makes the "thermostat". This works very simple. 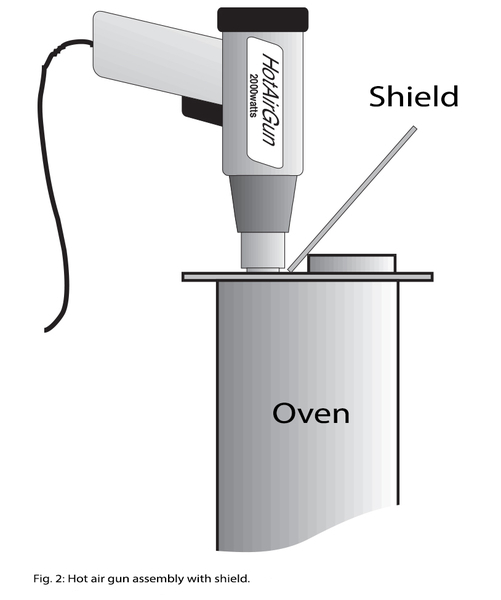 To heat up the oven for a 180 °C heat treatment, set the gun to maximum air output and temperature, insert the gun into the oven, place the "shield" sheet metal between the oven's opening and the hot air gun's nozzle and wait for about 8 - 10 minutes. Control the temperature in between. During the first several minutes the oven gets very hot at point "3", compared to point "1", but after 10 minutes there will be an equilibrium between all three measuring points. That means an effective temperature difference of about 4 - 6 °C between point "1" and "3". Let the temperature rise up to about 200 °C, then reduce the gun's temperature setting and wait until the thermometer's reading is about 190 °C. constant control. Immediately after hanging the sections into the oven, the temperature drops from 190 °C to about 170 °C, but within 1 1/2 to 2 minutes the temperature rises to 180 °C. Adjust the temperature setting of the hot air gun if necessary. Normally there is no further temperature adjustment required once the oven has reached 180 °C. After the desired time has passed, the rod sections can be taken out of the oven. Cookbook: For honey colored bamboo, bake for about 15 minutes at 180 °C. After 30 minutes at the same temperature, you'll recieve a medium brown tone. The bamboo still is crisp but not too brittle. Bon Appétit! Summary: The sections hang freely in hot, streaming air, short time for warming up, no lids to open and close, no turning of the sections required, no insulation required (if the size of the oven is not increased), usable for very light heat treatments, glueing under heat, or just for drying, inexpensive. Good luck and have fun, but be careful not to burn your fingers or other important parts of your body while operating the oven!